Gregor McGuckin sailed towards Abhilash Tomy’s yacht after his mast broke off in a storm on Friday. AN IRISH COMPETITOR in the Golden Globe Race has been praised for assisting with the rescue of his fellow competitor stranded in the Indian Ocean, despite his own yacht being damaged. 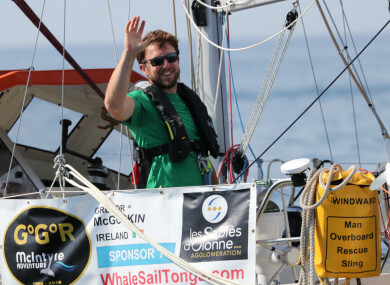 Gregor McGuckin, who lost his mast in the same storm as his competitor, did not declare an emergency for his own situation but instead sailed towards the site of Indian sailor Abhilash Tomy. The 32-year-old managed to build a jury rig and hand steer his yacht Hanley Energy Endurance for the past four days to be within 30 miles of Tomy. In a statement this afternoon, Team Ireland confirmed that both Tomy and McGuckin were onboard the French fisheries patrol vessel Osiris, describing McGuckin’s efforts as “an incredible show of seamanship”. The mast of Abhilash Tomy’s yacht Thuriya broke off when it was rolled in a storm on Friday and the yachtsman suffered what he described as a “severe back injury”. Tomy was unable to move from his bunk but heard an Indian military plane fire overhead and acknowledged this by turning his emergency beacon off and on. A spokesperson from Team Ireland said that following Tomy’s rescue it was deemed to be the safest course of action for McGuckin to abandon his yacht “under a controlled evacuation scenario as the opportunity arose”. The considered move ensures in the event that his own situation deteriorated in any attempt to reach land in the coming weeks a second rescue mission would not be required. Tomy is reported to be conscious and talking while McGuckin’s condition has been reported as nothing more than bumps and bruises. “Gregor McGuckin’s Team, friends and family would like to express their sincere gratitude to all involved in the operation so far. “Our thoughts are now with Abhilash and his family,” a Team Ireland spokesperson said. When the storm hit on Friday, the Australian Defence Force said it would assist in the rescue, with the frigate HMAS Ballarat sailing from Perth late Saturday night towards the yacht. In an update from race organisers yesterday, they said that McGuckin’s yacht was the nearest vessel and was also expected to reach Tomy at some point today. “Weather permitting, he may be asked by the Joint Rescue Coordination Centre (JRCC) in Canberra to abandon his own yacht and board Thuriya to provide immediate assistance to the injured yachtsman,” they said. Telemedicine doctors MSOS in the UK would then be able to speak directly to Abhilash via Gregor’s satellite phone and suggest appropriate first aid as well as advise JRCC of his condition to help forward planning. The Indian Navy had also diverted two vessels from exercises off South Africa to assist in the rescue. With reporting from Sean Murray. Email “‘Incredible show of seamanship’: Irish sailor praised for assisting fellow competitor stranded in Indian ocean ”. Feedback on “‘Incredible show of seamanship’: Irish sailor praised for assisting fellow competitor stranded in Indian ocean ”.